Now you can help Support Calaveras Big Trees Association as you Shop! 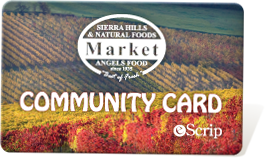 The owners of Sierra Hills Market and Angels Food Market have generously made available the Escrip program to benefit local non- profit organizations through the use of the Escrip Community Card. When you use your the card, CBTA has the ability to earn up to 5% of monthly purchases when you shop at either market. How easy is that! Just show your card or give the clerk your phone number and you help support CBTA. Once you are enrolled, you can go online and find out about other benefits of the Escrip program. To sign up simply down load the form Escrip Form here, fill it out and take it with you the next time you shop at Sierra Hills or Angels Food Markets, or you may sign up in the store. Please indicate Calaveras Big Trees Association as your desired beneficiary. If you shop at Amazon.com, you can now support CBTA by shopping at AmazonSmile. Everything like Amazon Prime works just the same once you are registered. When first visiting AmazonSmile, you will be prompted to select a charitable organization from almost one million eligible organizations. For eligible purchases at AmazonSmile, the AmazonSmile Foundation will donate 0.5% of the purchase price to the customer’s selected charitable organization. However you choose to do it, it is a painless way to help CBTA continue its efforts to provide outstanding interpretive and educational programs at Calaveras Big Trees State Park. Thank you for your continued support. Please call the office with any questions at 209-795-1196.